A new study found passengers are losing personal space on many aircraft at a troubling rate. But Congress may require minimum seat standards. And regulators are looking into the safety aspect of the squeeze. Meanwhile, you can try these suggestions. If you’ve ever asked yourself “How much smaller can these airline seats get?” there’s good news for you: Not much. The Federal Aviation Administration (FAA) Reauthorization Bill working its way through Congress requires the agency to set minimum seat width and pitch standards within a year. Separately, the Department of Transportation Inspector General has begun an audit to determine whether evacuations in today’s more cramped airline cabins can still meet the 90-second standard for getting passengers out in an emergency. And, despite the government’s recent reluctance to regulate this issue, it seems we’re on course for the government to set a seat standard of some kind. It’s high time. A new study by airline consulting firm ICF recently showed passengers are losing personal space on many aircraft at a troubling rate. In the U.S. domestic fleet, the average number of seats per aircraft has increased by nearly 8 percent over the past 15 years. The average Airbus A321 has gained 19 seats in that period, rising from 169 to 188 seats. The average Boeing 737-8 has squeezed another 13 seats on board during that time, going from 152 to 165 seats. Pat Vosburgh is 5’11” and says she’s no fan of government regulations that interfere with business. But on this issue, she’s also willing to make an exception. Minimum seat standards might also improve passenger wellness. “The argument about health is more prominent on long-haul flights,” says aviation educator and author Triant Flouris. With greater mandated legroom and more space to move, passengers are less likely to develop blood clots. But the main benefit of more space would be psychological. Not feeling as if you’re trapped in a claustrophobic aluminum tube with nowhere to go may cut down the number of air-rage incidents. On the other hand, seat comfort could decrease a little. “If airlines can’t reduce space, padding and comfort will be the first to go,” predicts Zander Futernick, founder of ZED Aerospace. 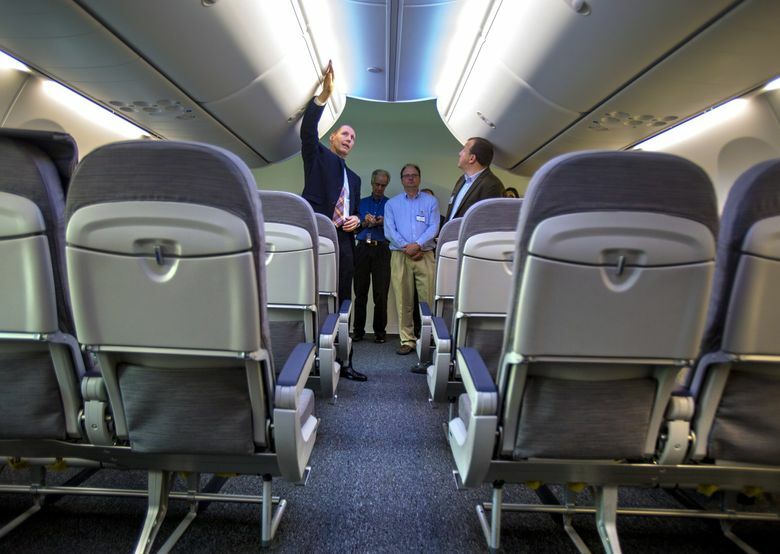 He says low-cost carriers have “completed their race to the bottom” by cutting legroom. Now they’re removing padding and other standard seat features, such as tray tables. The legacy carriers will probably do the same if seat standards are set. Prices could climb, too. Of course, critics of regulation always say that new rules will make prices go up, but with no way to add new seats to the aircraft, the only way to increase revenue would be to increase fares. But on balance, the rules could result in reduced in-flight incidents involving angry passengers and fewer complaints, says Kent Gourdin, who directs the Global Logistics and Transportation program at the College of Charleston. The devil is in the details. What will the minimum seat size look like? No one knows. “Depends on what the plan is,” Gourdin says. Regulation may be worth it. Because during the next aviation disaster, being able to evacuate a plane could save lives. Maybe your life. And how do you put a price tag on that? Avoid “low cost” carriers. Airlines like Allegiant, Frontier and Spirit have a well-deserved reputation for small seats and a scarcity of personal space. Let’s just put it this way: People don’t fly those carriers for their comfort. Look for the good seats in economy. The exit row and bulkhead seats typically have more room than a standard seat, if you can afford them. The worst seats are the ones in the rear of the aircraft, which don’t recline. Stay out of those if you can. Southwest now offers the most standard legroom, with 32 inches of seat “pitch” — a rough measure of legroom on a plane — according to Seatguru.com. Travel with pillows and blankets. Even if you’re in a “premium” seat, it’s also true that the cushions aren’t what they used to be. Bring your bedding to keep things civil on your next flight.